If you’re planning to visit this historic university city, check out our guide to the best places to stay in Oxford. In amongst Oxford’s famous colleges and dreaming spires, there are elegant boutique hotels such as the Old Bank Hotel and The Old Parsonage. But there are also budget hotels, pubs with rooms and in the Oxfordshire countryside, quirky hotels like The Crazy Bear. If you don’t want accommodation in central Oxford, try the Georgian town of Woodstock which is home to Blenheim Palace. 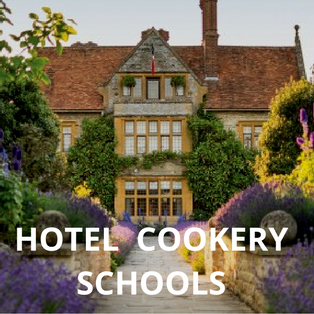 With hotel rates provided by our Booking Partners, you can check availability and book. 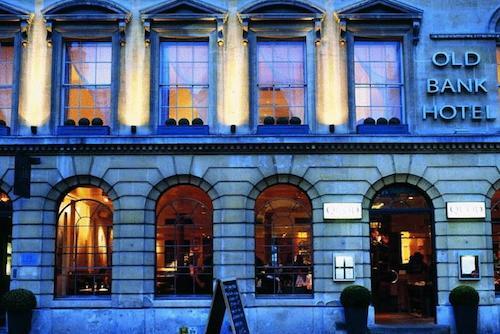 Standing proudly amongst the colleges on Oxford’s historic High Street, Old Bank Hotel can boast one of the best addresses in this famous university town. 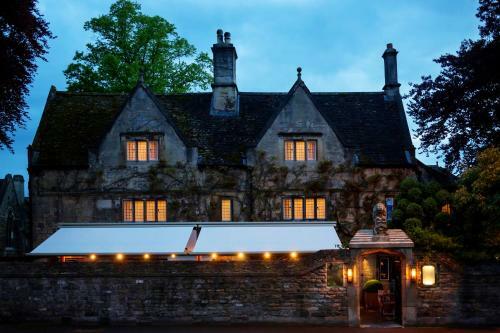 Stay here and you’ll experience a sophisticated slice of Oxford life. Spacious bedrooms come with luxury bathrooms and contemporary art. Ask for a room at the front of the hotel for a view of the city’s dreaming spires. Read our Expert Review of Old Bank Hotel here. This Malmaison is a unique place to stay in Oxford as it was once the city’s jail. Now converted from a Victorian prison into a modern and quirky boutique hotel, they’ve cleverly combined cells to make luxury accommodation. Don’t miss visiting the remaining prison cell in the hotel’s basement to get an authentic flavour of its past. The Malmaison has its own brasserie and two bars. For alternative dining, try the rooftop restaurants in Oxford’s brand new shopping centre next door. The Feathers hotel is a chic townhouse in the charming Georgian market town of Woodstock. It offers an enviable trio of delights – historic Blenheim Palace on its doorstep; one of the world’s largest selections of gin in the bar and the historic city of Oxford just over 10 miles away. With antiques, log fires, lovely bedrooms and wonderful surrounding Cotswolds countryside, it has everything you need for a weekend break. Cosy, chic and clubby. The Old Parsonage Hotel combines old Oxford charm with stylish, contemporary and oh so tasteful, interiors. The hotel is steeped in history and atmosphere with many of the rooms retaining original features. Find a private nook in the stunning Library for a quiet read and a drink. The hotel is located away from the hustle and bustle of the city centre but it’s still close enough to explore Oxford on foot or by bicycle (provided free for guests). There are 35 luxury bedrooms, all with marble bathrooms and the owner’s private artwork adorning the walls. What a treat. Neatly tucked away down a side street, Vanbrugh House is a small and intimate boutique hotel right in the centre of Oxford. The Grade II listed building was designed by Sir John Vanbrugh, the man behind Blenheim Palace. Original beams, fireplaces and wooden panelling all add to the hotel’s unique character. The 22 bedrooms vary in size but come with smart bathrooms and White Company toiletries. Tuck into a Full Oxfordshire English at breakfast. The small dining area serves lunch and afternoon tea (no evening meals) and is open to locals. A quirky and unique place to stay bang in the centre of Oxford. The Turl Street Kitchen isn’t a fancy restaurant with rooms but a down to earth one with a social conscience. It began life as a student initiative and now supports several Oxford charities. Big on sustainability and ethical sourcing, it’s a relaxed and popular gathering place for locals. Eat breakfast here each day and sleep just around the corner in the Tower House. There are 8 double rooms in the Grade II listed building (some share bathrooms). The 16th century tower and ancient city wall add extra character. Enjoy traditional pub food and a peaceful village setting but still have easy access to the city. The Bear and Ragged Staff is a popular village pub, just 4 miles West of the centre of Oxford. After a day exploring the historic city, relax with a glass of wine by the fireside in the pub’s cosy olde worlde bar. There are 9 well-appointed en-suite bedrooms located above the old pub and in a wing of restored cottages. The Oxford Townhouse is a clean, smart and newly refurbished Guest House. From here it’s an easy 10-minute walk into the centre of Oxford. If you prefer to hop on the bus, there’s bus stop right outside. Rooms come with handy tea and coffee making facilities and breakfast is generous. Oxford sausages are from the Covered Market (the vegetarian ones are homemade). Parking is free. A superb boutique bed & breakfast with 3 luxurious bedrooms right in the heart of historic Woodstock. The Glove House is an impressive Georgian townhouse with a pretty walled garden. You get spacious accommodation, super-king size beds, antique furniture, the finest linen, original works of art, huge showers and claw foot baths. Nespresso machines, Pure clock radios and wifi keep it on trend. Blenheim Palace is within walking distance and Oxford, a 7-mile drive away. Rooms from £170 a night. A jewel of a place. The Crown Inn does boutique well. It has a bar, a popular restaurant and 5 very stylish en-suite rooms. Expect chic fabrics and furnishings, pops of colour, interesting artwork, Bose sound docks and attention to deal. Small touches like fresh milk, loose leaf tea and teapots in rooms, make it a luxury retreat from home. Dogs can come, too. A sophisticated, stylish but ultimately relaxing countryside retreat. The Artist Residence is an old thatched pub with tasteful rooms near Witney. It’s the new kid off the block from the dynamic duo behind the superb Artist Residence hotels found in London, Brighton and Cornwall. Luxury modern meets cosy with huge fireplaces, interesting art and quirky touches. There are five gorgeous bedrooms with Anglepoise lamps, Roberts radios, old tea chests for bedside tables and pops of colour. The icing on the cake – dogs are welcome. Oxford is 8 miles away. Rooms from £140 a night. It’s the riverside location that makes this 17th Century country pub with rooms popular for weekend getaways. You can bring your dog and walk the Thames path or explore the surrounding Cotswolds. The lovely town of Bampton, used as the backdrop to scenes in Downton Abbey, is just up the road. 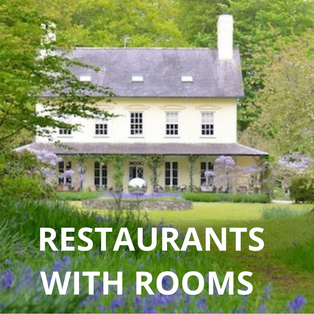 Rooms are comfortable and the pub grub hearty. At the end of the day, relax with a drink in a comfy armchair next to the fire. A quirky and very unusual place to stay in the Oxfordshire countryside. The Crazy Bear Hotel in Stadhampton is indeed crazy. Its multiple personalities reveal a red double decker bus that’s the hotel reception, a cosy old worlde bar, a vision-in-pink dining room, a Thai restaurant and velvet-clad bedrooms. If you know all the names on the Farrow & Ball paint chart, it’s probably not for you. If you’re feeling a little crazy, it’s just the ticket.